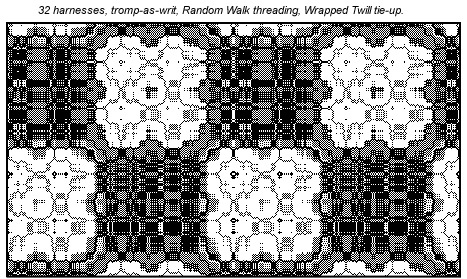 WeaveMaker is fundamentally a dobby weaving program. However, its cornucopia generates designs which can stretch the limits of dobby weaveability. Indeed, used at, say, 32 harnesses, some combinations of cornucopia settings are practically guaranteed to generate unweaveable designs. And yet many of these designs are beautiful, and certainly they tend towards the unusual. Thus, designers using WeaveMaker will see designs they like but which they are disinclined to dobby weave. There are several possible solutions to this dilemma. One would be to use WeaveMaker’s CAD tools to improve the weaveability, a quite practical approach but one which may reduce the qualities of the design which make it so attractive. Another would be to interpret the design as a knit fabric rather than a woven one. Another would be to use a jacquard loom in place of a dobby loom. This section deals with the latter approach—recasting a WeaveMaker design for dobby weaving. The existing threading, tie-up, treadling, and peg plan will be erased, as these are irrelevant in jacquard weaving. The grids which held these elements are still present in a one-harness or one-treadle form, but this is only done to enable you to continue to use the selection tool and thus create repeat blocks; the grids themselves will always be empty. The drawdown is converted to black and white. 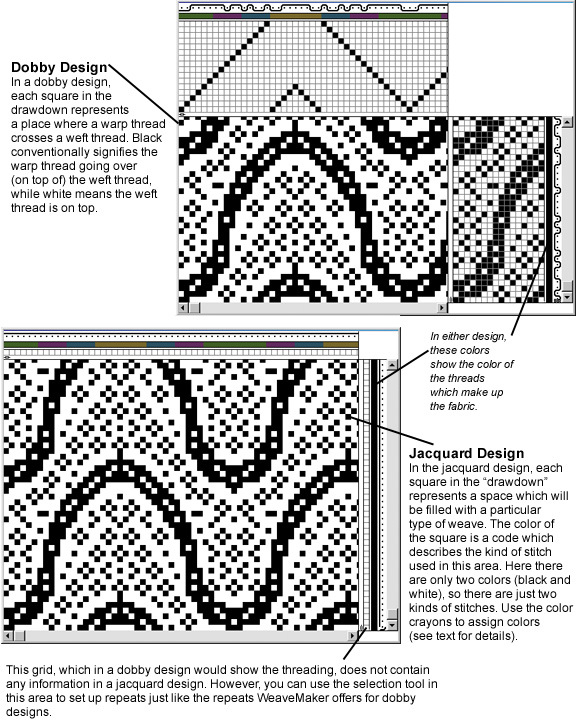 In a WeaveMaker jacquard drawdown, color denotes a type of weave, not the color of the fabric at that point. Thus you start off with two types of weave (the assignments of weaves to colors is up to you, so “white” and “black” weave types will be whatever you wish them to be). While in jacquard mode, you will use the crayon tool to set colors (weave types) in the drawdown. But you can also use the crayon tool to change thread color assignments in the warp and weft (just as you would in a dobby design). In the former case, you are using color as a code to show the weave type, while in the latter the colors stand for themselves. If you edit the colors in the Tool window, you will be editing both the weave-code colors and the thread colors. Clicking a square in the drawdown with a crayon changes that square to the crayon color. Hold down the command key and note that the cursor changes to a pencil. Use this to set a square to black or white (click once for black, click again for white, click again for black, et cetera). 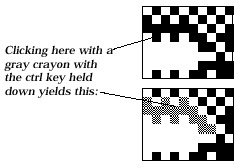 If you hold down the control (“ctrl”) key and click, the square under the crayon changes to the color of the crayon, plus all squares which are in contact with that square and are the same color as it also change to the new color (see illustration below). This lets you set large, connected areas of the design to a new weave quickly. The diagrams on the facing page illustrate some points about WeaveMaker’s jacquard printing. 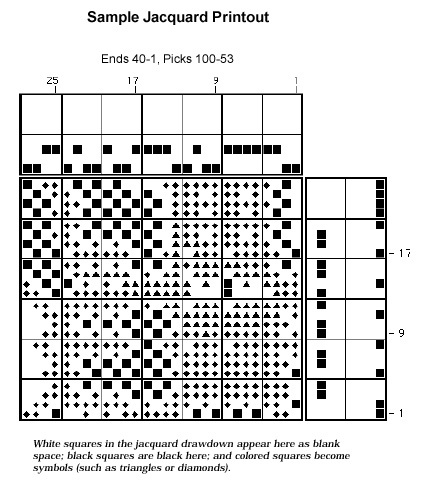 Note in particular that the weave codes, which are represented by various colors in the jacquard drawdown, are converted to weave symbols in the printout. These guide the mill in setting up the loom. The thread colors appear in the printout just as they would in a WeaveMaker dobby printout, and all the same options of grid size and formats for showing colors are available to you.